A Diamond Select Release! Toy Biz and Diamond Select present this awesome new Ultimate Universe action figure of the gray-skinned giant known as The Hulk! 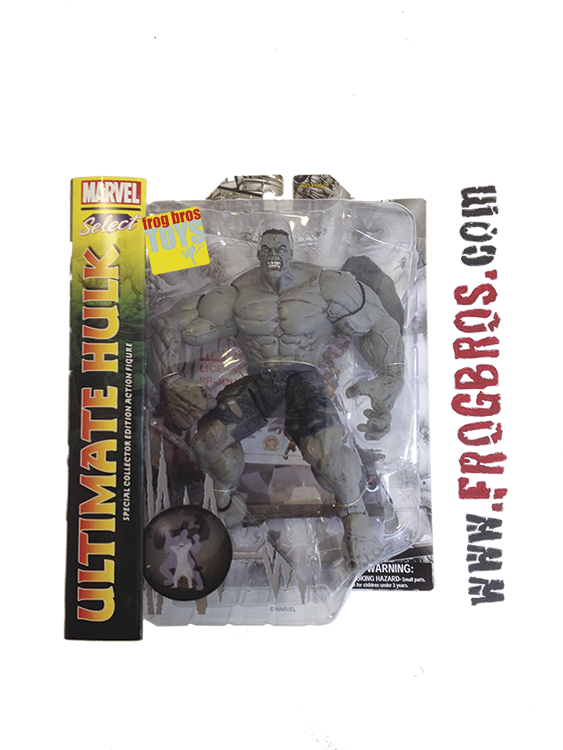 Scaled to the standard 7" size of the rest of the Marvel Select action figure line, Ultimate Hulk stands over 8" tall (hunched over, no less! ), and stands head and shoulders above the rest! Sculpted by Sam Greenwell, the Ultimate Hulk is one of the most articulated Marvel Select figures yet, and includes a scenic backdrop base. This one is truly. well, Incredible! A stunning 16 points of articulation on a figure this well detailed include neck, shoulders, wrists, hips, ankles, and more. Not available in mass-market outlets and packaged in deluxe blister card package!